Ever faced a problem when you couldn't decide between two or more whiskies to buy and when the only thing stopping you from buying both is the price? I bet it happens to you all the time, unless of course you're some kind of wealthy person, in which case you can stop reading this review now. Go ahead and sip your expensive spirits in your mahogany floored library full of leather bound first editions and a magnificent fireplace glowing in the background. For the rest of us it can sometimes be quite a decision but it doesn't necessarily have to be a big one when you've got a service that literally allows you to buy samples by the dram without having to spend a big chunk of your earnings at one go and then ending up disappointed when the bottle you chose wasn't good after all! Drinks by the Dram is just that kind of concept, making available small and inexpensive samples for most of their products that you can try before spending good money on that bottle you're wondering about. So if you were ever in doubt, have a look at their fantastic range of drams and build yourself a sampler kit or two of whiskies you've always wanted to try! By the way, they also do rum and other spirits. Now of course, it wouldn't be a review at all if we didn't have a few drams to try ourselves here at Refined Vices, so we have chosen three drams to try. Our kit consisted of three different whiskies, each in a small 50cl sized bottle labelled and sealed with maroon wax. Have I mentioned I love wax seals? 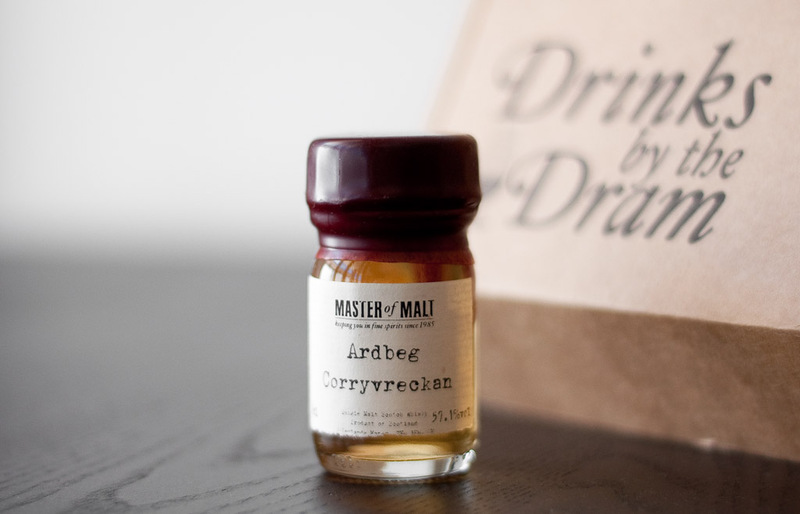 Our first dram is the Ardbeg Corryvreckan, which is the younger replacement for the 1990 Airigh nam Beist and matured in first-fill French oak casks and ex-bourbon casks. The "Corry" has not been chill filtered and comes at a high 57.1% ABV! A pale but clear golden straw colour with white sparkly highlights and phantom legs disappearing into pinhead sized droplets and then into nothing. Very potent, warm and medicinal. The sharpness of it mellows down quickly, just after a couple of minutes. The aroma keeps evolving from lingering crisp ship tar to chocolatey nuts, pineapple and fruits that peak from the depths of the whirlpool with sumptuous but subtle vanilla beans. First sip is sharp with the spiciness building up almost exponentially on the tongue but a little water allows exploring the other flavours more closely, without the spice overwhelming the palate. This brings out a soft malt flavour, smoky peat and crisp tar. Warm, invigorating and bursting with malty and spicy flavours but quickly smoothening towards the end releasing some vanilla, smoke and peat. As a final note there is a rather refreshing smoked pineapple flavour with gentle, peaty smoke that seems to last forever. 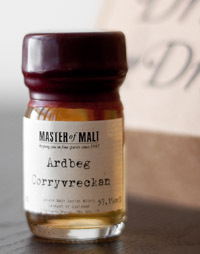 The flavours and especially the aromas in Ardbeg Corryvreckan evolve rapidly from layer to layer, covering such a wide spectrum of them before settling down, creating a very interesting and unusual drinking experience. The second dram comes from Japan's Hanyu distillery and is part of a playing card themed whisky range. 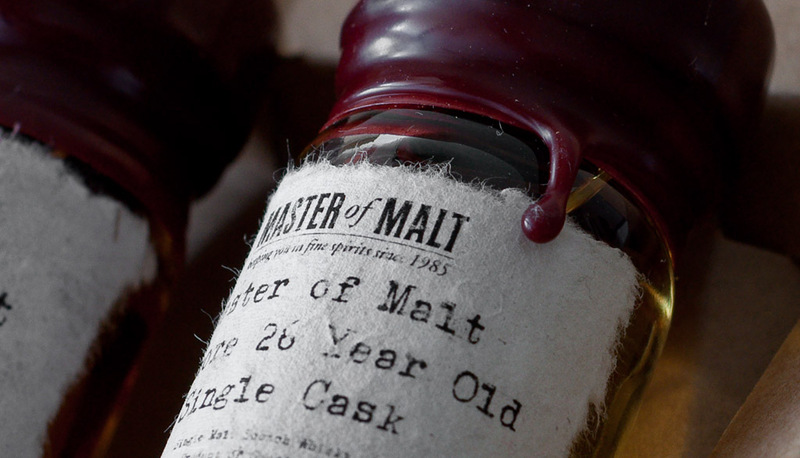 It is aged for 18 years and finished in Mizunara Hogshead or simply put, Japanese oak. Clear and golden brown, forms long thin veins on sides of the glass that slowly become shorter. Initially the nose has cool bourbon barrel aromas with vanilla, gentle spiciness and woody notes combined with hints of ripe green apples, leather and a soft touch of caramel. As with many spirits, this one too benefits from a little airing as it makes the overall aroma softer and warmer with the caramel becoming more prominent pushing the bourbon and the spice somewhere in the middle. Warm bourbon flavours, lots of spice but not in a harsh way and slight curdling and bitterness on the tongue. Little bit of smoke, caramel and chocolate and a very warming sensation when swallowed. Slightly malty with bitterness around the tongue, compensated by soothing vanilla flavours. Five of Clubs finishes short and dry with a final note of bourbon. 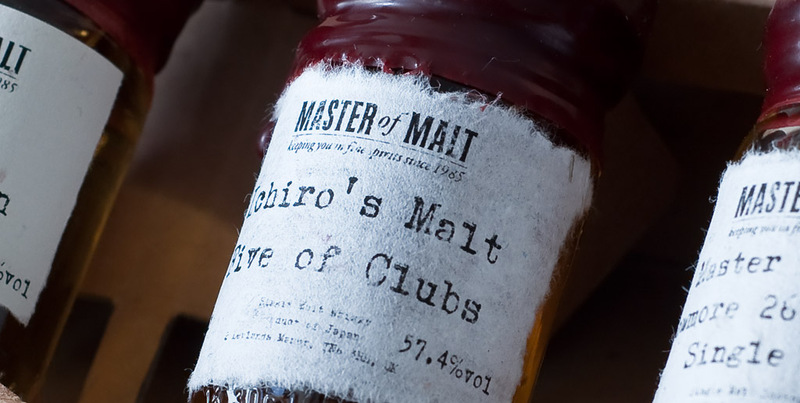 Ichiro's Five of Clubs is very smooth for a whisky with such a high ABV. Our final dram is a single cask islay malt distilled by Bowmore and bottled for Master of Malt. 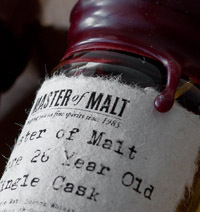 At 26 year old it is the oldest whisky of the drams but surprisingly the full bottle is moderately priced at 99 pounds. Pale gold with a nice silver shine on the edges with medium to bold legs clinging to the surface of the glass. Big and very definite, dry but sweet, perfumed lavender puffing beautifully out of the glass with fruits emerging from underneath the flowers. Captivating your nose, a striking pineapple note and an infusion of tea, lavender and other floral scents begin to blossom after a while of airing the whisky. Not letting go of your senses yet, different scents seem to continuously evolve, similar to Corryvreckan but patiently and I can now detect hints of copper, leather and rich, creamy vanilla. Bowmore 26 it seems, is a whole garden of scents and theres is just enough of every specimen. Sweet lavender entry with increasing malt flavours the longer you hold the whisky in your mouth and at the same time other floral flavours gently burst into life, like a display of fireworks in the distance. Sweet floral explosions continue in the mouth with the malt turning into a dry, slightly dusty wind that surprisingly is carrying a vibrant pineapple note accross the palate, eventually fading into a very creamy aftertaste. Not only is Drinks by the Dram a great way to try several whiskies at a fraction of the cost of a real bottle, I think it would also make a great gift for any occasion, be it Christmas, birthday or Father's day. 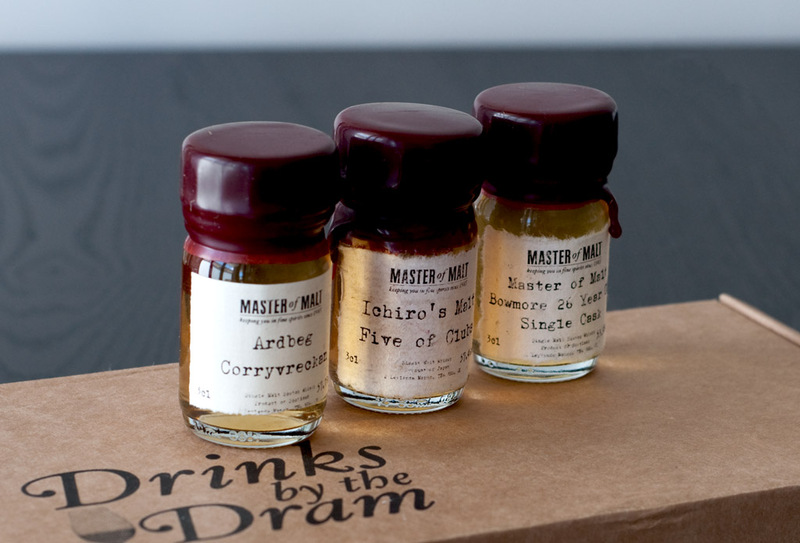 Have a look at their page for recommended Whisky Gift Ideas and www.masterofmalt.com for more info.